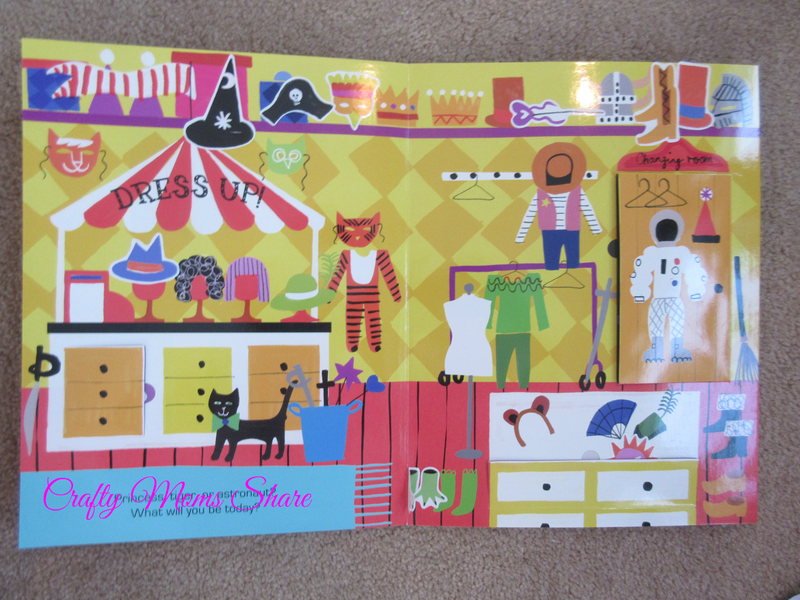 I have to thank Candlewick Press for sending this great activity book for us at the perfect time! Perhaps it is because they are based in Massachusetts, but somehow this perfect sticker activity arrived the day before the blizzard or at least the afternoon before the blizzard started that night. Now Hazel and I often ride out the storms without Steve since he works for the power company and has to be ready to help when the power goes out. He sleeps at the office and works crazy hours. Therefore it is always good to have something for Hazel to do and keep her entertained. 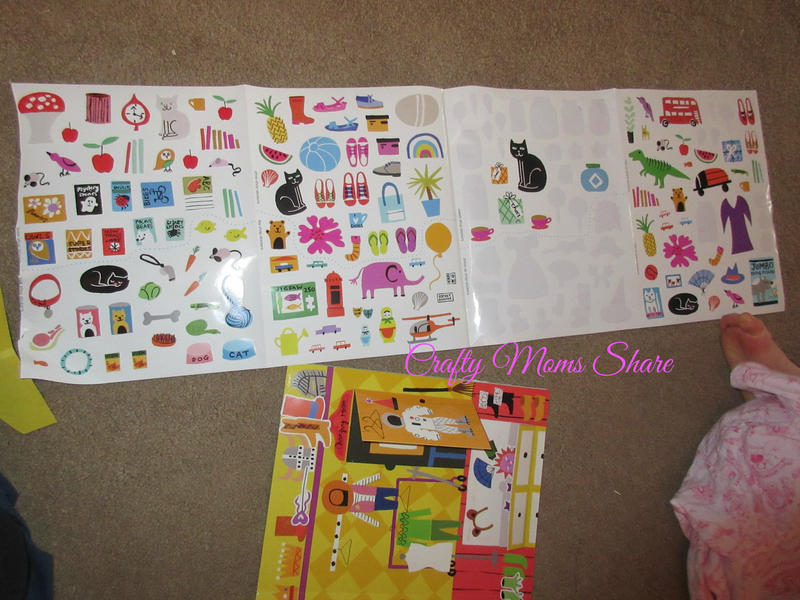 Imagine my joy when I opened a package containing Sticker Style Shop by Jenny Bowers the afternoon before the storm. It officially is available February 10th. 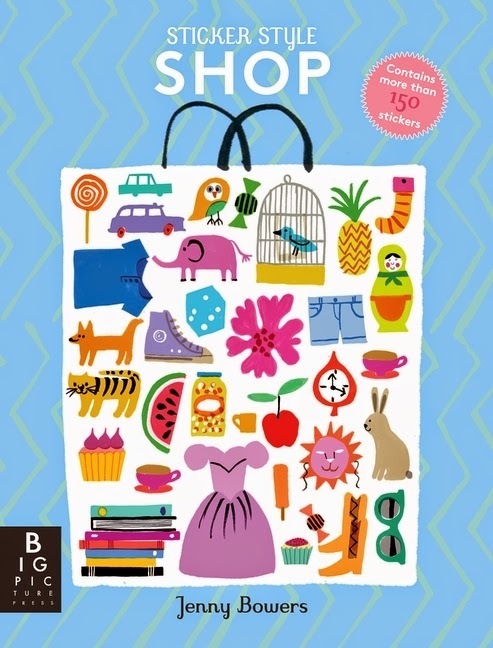 This activity book comes with more than 150 stickers to add into the various shop pages: Candy Store, Costume Shop, Shoe Store, Toy Shop, Book Store and Pet Shop. 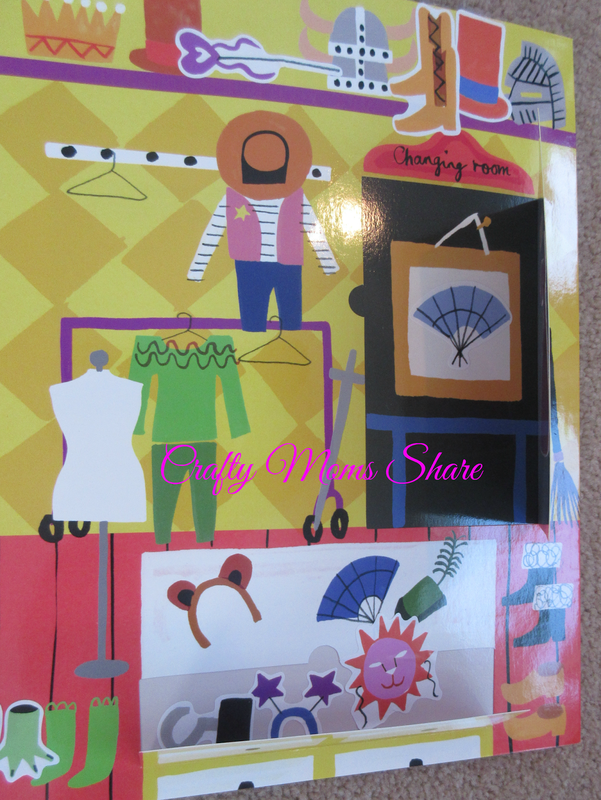 Each of the stores have flaps to open and stickers can be put behind the pictures (in cabinets, cages and more). While I was working on the computer Tuesday morning, Hazel started on this book. She had so much fun!! She would bring the book over to me to read the sentence about the store. Then she would get to work. She did not look ahead to see what stores there were so she saved some stickers of each type in case she needed them. Now she is going to go through and add those stickers on. We loved this book!! She had so much fun doing it. In the mean time the snow kept falling and falling. You can see our bird feeders that normally are relatively high above the ground, now have a foot and a half or so to the snow and this is in a tree protected area. 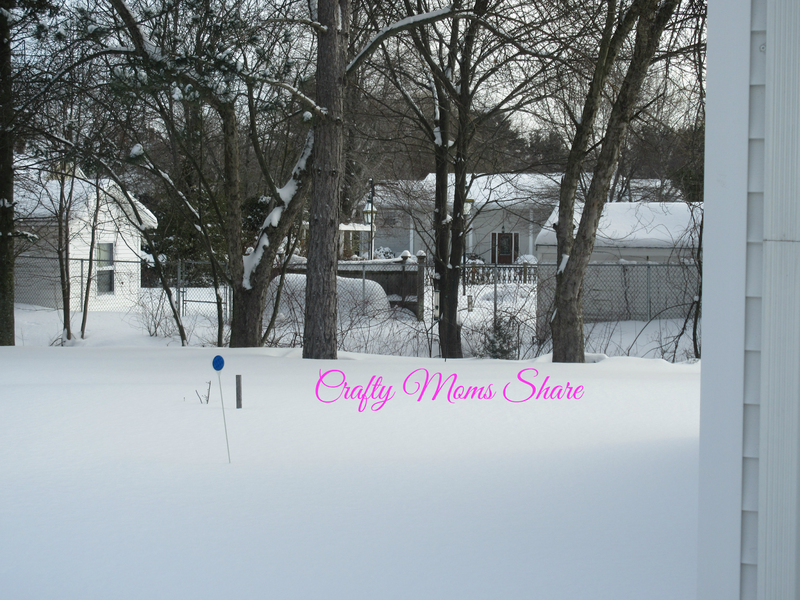 We got around 30 inches of snow and high winds that caused the snow to drift every which way. Hazel and I did not adventure out yesterday, but luckily Steve was able to come home last night! 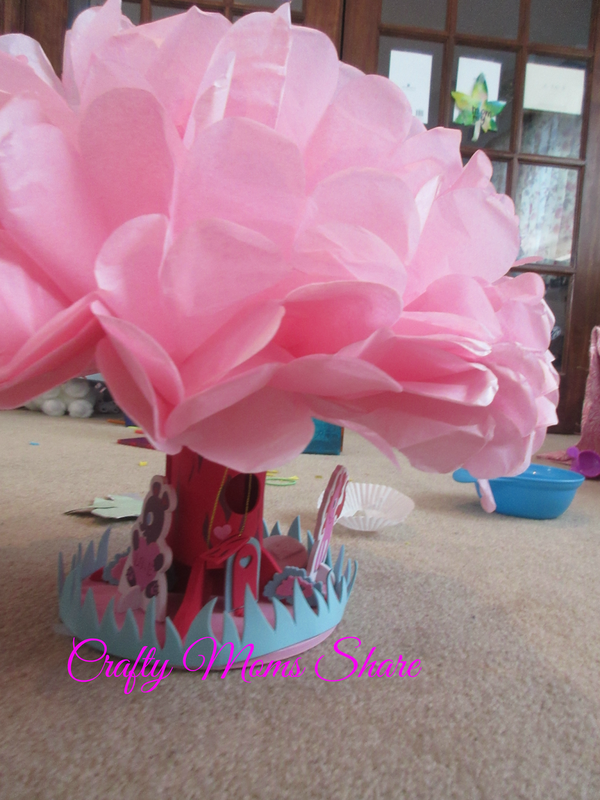 The other activity she did was to put together this foam tree from a kit I bought at Michaels. She loved it and only needed a little bit of help from me. Afterwards she was playing with it and the foam animals that it came with. Overall it was a fun snow day and now she is super excited to have a second one. The snow has stopped (sometime overnight), but the roads, driveways and parking lots are still needing lots of work, so the schools are still closed. Maybe today we will adventure out in the snow! 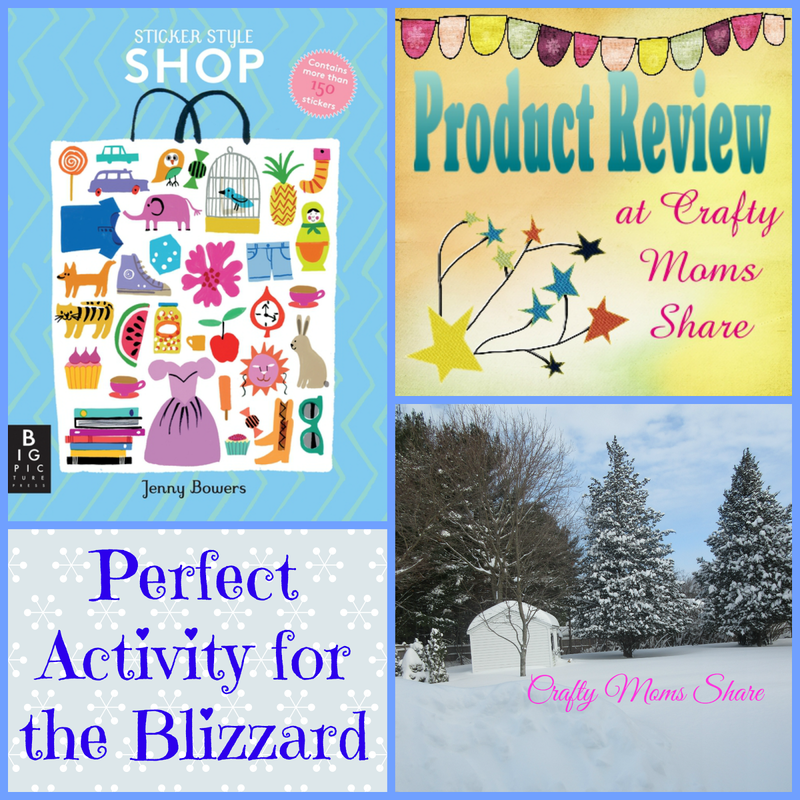 For more reviews of Candlewick Press books check out: Fun Crafts and More Books (one of which we recently bought for a birthday gift for one of Hazel's friends), Travel with Books at Home, Picture Books Review and Once a Shepherd Review.